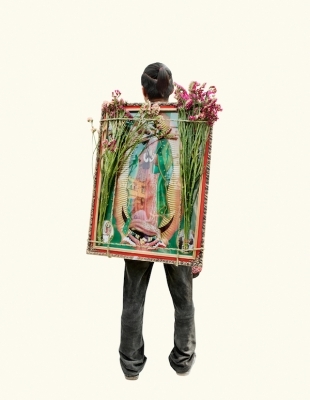 Alinka Echeverría’s The Road To Tepeyac, a series of photographs of pilgrims to Mexico’s famed Basilica de Guadalupe, is an invitation to think about altars, embodiment, and visibility. Alinka and I met on November 14, 2014, at the Berkeley Art Museum and spoke of many things, including her experience growing up in a small village in England, where her family relocated to from Mexico while her father completed his graduate degree. Alinka studied anthropology in Europe and began working as a documentary photographer but felt creatively stymied. Exhibiting her photographs, on the other hand, has led to work somewhere between documentary and fine art, anthropology and something else—a reflection upon seeing itself, and the threshold of the visible. Millions of pilgrims undertake this annual journey to Tepeyac in Mexico City to commemorate the five apparitions of the Virgen de Guadalupe Saint Juan Diego saw here in 1531. Alinka told me about how she had gone twice to photograph the pilgrims. The second time, she staked out a spot and her mother, a documentary filmmaker, assisted her in bringing the pilgrims over. She photographed more than 300, all from behind, all against a white screen. 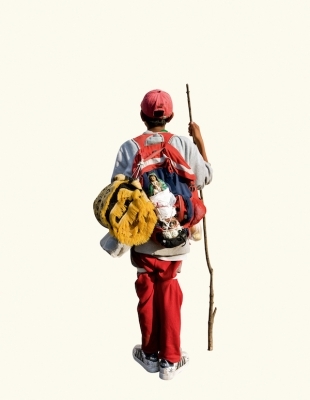 Echeverría’s representation of the pilgrims from behind reproduces what other pilgrims, one walking behind the other, would see much of the time on their journey. It also prevents or interrupts the viewer from objectifying the subjects into character or social types based on facial features or expressions. Though their faces are not visible, they are not erased or rendered mere vehicles of the sacred images they carry. One installation of the Tepeyac series involved about 100 of the images, displayed three deep, one above the other, on the gallery walls. In the viewer it created a feeling of submersion that recalled the experience of moving amidst innumerable Guadalupes bobbing upon the backs of a sea of pilgrims. What predominates visually, in what Echeverría shows us, are large or small variations of Guadalupe in images carried from homes or villages to be blessed. 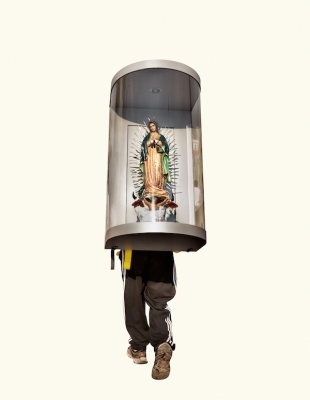 There are, one can surmise, as many home statues, prints, and drawings of Guadalupe as there are pilgrims. 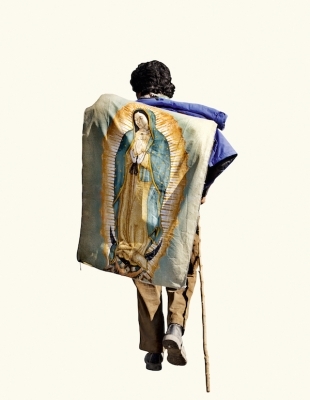 In a way, Echeverría’s photograph of each pilgrim is yet another version of the Virgin of Guadalupe. 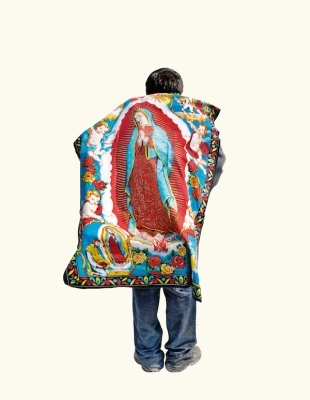 The discreteness of a subject’s back and the Virgin’s image upon it, set starkly against a white screen, has the effect of an image set within a burst of light, akin to the full-body mandorla, the rays of light, or the sunburst surrounding renditions of the Virgin of Guadalupe. 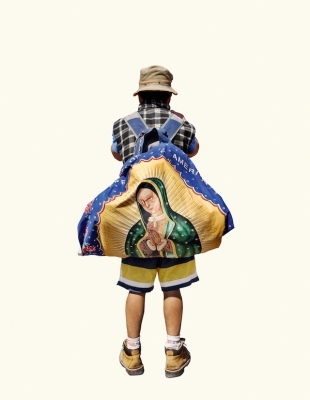 In taking photographs of the images of the Guadalupe carried on pilgrims’ backs, a photograph of an image of an image has been taken. 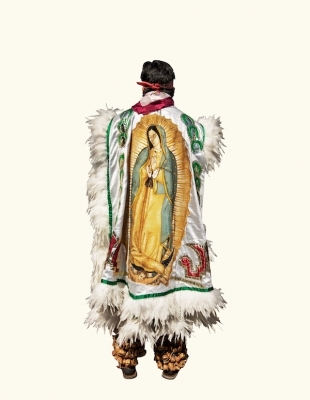 The image the pilgrims bear is a copy of the original, miraculous image of Guadalupe that was imprinted on Juan Diego’s tilma (or cloak) to prove her identity to the world. But in spiritual pilgrimage, an image of a sacred image is not necessarily just an image. Here, sacred images are like prosthetic limbs, enabling power, movement, and even identity through hybridization of body and image. Some of the pilgrims photographed by Echeverría adorn their statues of Virgins and saints, tilma reproductions, personal drawings, and related images with flowers and other offerings. 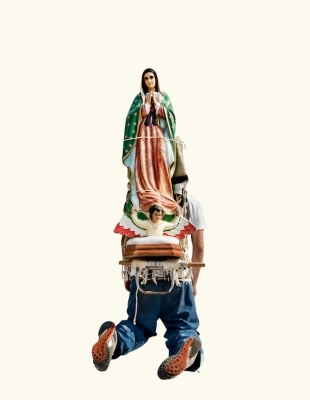 In this way they carry not just themselves in pilgrimage to the shrine where the Virgen was said to have appeared to Juan Diego; they carry an altar as well, as Christian Cajoule observed in his introduction to the publication of Echeverría’s prize-winning photographs, Sur le Chemin de Tepeyac. Indeed, one wonders if, in their devotion, they too, bodily, are some part of that altar, its heart, even as they are the altar’s evident motor, the fuel that permits the altar’s mobility. Their veneration through a reproduction of the original miraculous image seems to call into question the very thing the West calls image, and upon whose definition its possible functions must rest. Looking at these photographs, I wonder if we truly know what an image is and the work it does? 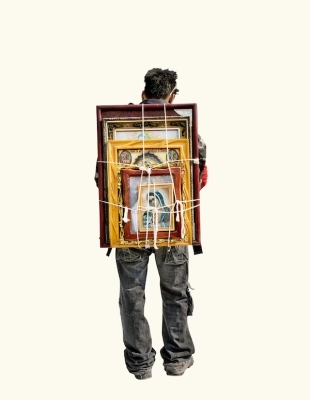 The Tepeyac pilgrims’ creation of altars on their backs make them a portal between the seen and the unseen, the spirit and the flesh, the earthly and the divine. Here, sacred images are like prosthetic limbs, enabling power, movement, and even identity through hybridization of body and image. Echeverría’s series functions through paradox as well. Her photos convey the pilgrims and their particular altars as unique yet also part of the larger corps of the devoted, who together invoke, if fleetingly, a body for the Virgin. For whether from indigenous, mestiza/o, or orthodox Catholic spiritualities, what is given physical presence by all the pilgrims is the sacred, brought into view by their pilgrimage, their altars, their performance as intrinsic parts of walking altars. 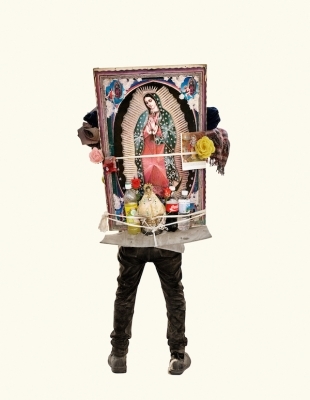 The bodies Echeverría records strive to materially give form to the Virgin—or perhaps more broadly, the Creator—and through their pilgrimage, they animate themselves as signs of devotion. Through their march, they make an ofrenda, an offering. In this way, as individuals and en masse, the pilgrims to Tepeyac give body, literally, to a spiritual idea, that of the movement, the ubiquity, or omnipresence of Spirit and sacredness. For after all, and like a tattoo, the Virgin in that pilgrimage marks the pilgrim’s body, is unified with theirs visually. 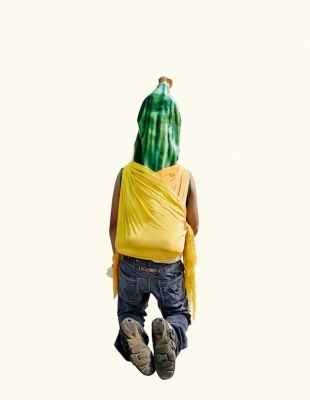 This visuality, this appearance that is the result of accumulation of various kinds of objects, including ropes, water bottles, even children, on top of the body of the pilgrim temporarily, is together meant as a sign of the reality of the invisible realm to believers. 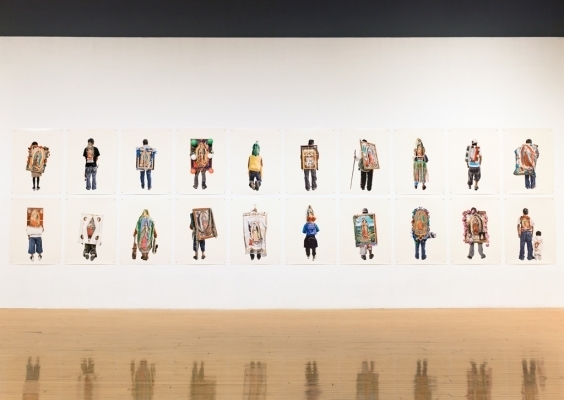 Perhaps Echeverría’s images are also spiritual portraits, in that what is shown of the pilgrims is their innermost identifications with the Mother and through her, with each other, and perhaps us, as viewers. Mary of Nazareth beams in and out in traces of the biblical and apocryphal accounts of her life. As do Guadalupe or the Aztec Creator Mother goddess Tonantzin in the visual reproductions and imaginings of her carried on the pilgrimage. And on the pilgrimage she is gritty, knocked about, soiled, and manhandled. Earthy but conviviendo, at home on the bodies of those who pilgrim to her and to the Creator through her. The camino. The path. Camino al Tepeyac. 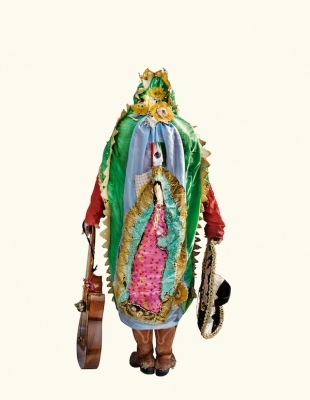 Through Echeverría’s lens, what is glimpsed is the pilgrims’ performance of living as ex-voto, as enigmatic testimonial that the Virgen is present and that she’s got their backs, which is to say, ours. Laura E. Pérez, is associate professor in the Department of Ethnic Studies, University of California, Berkeley. 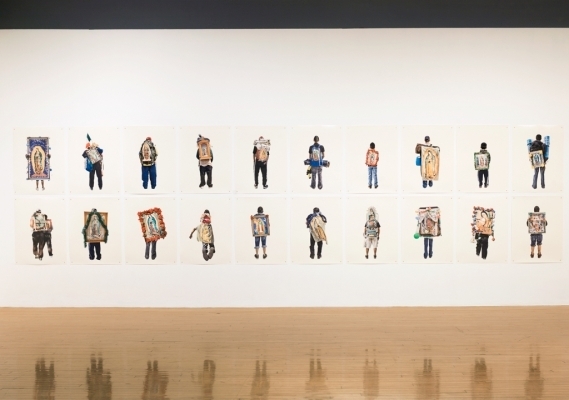 Pérez co-curated Chicana Badgirls: Las Hociconas (2009) and curated Labor+a(r)t+orio: Bay Area Latina@ Arts Now (2011). She is the author of Chicana Art: The Politics of Spiritual and Aesthetic Altarities (Duke University Press, 2007) and Ero-Ideologies: Writings on Art, Spirituality, and the Decolonial (Duke University Press, forthcoming). 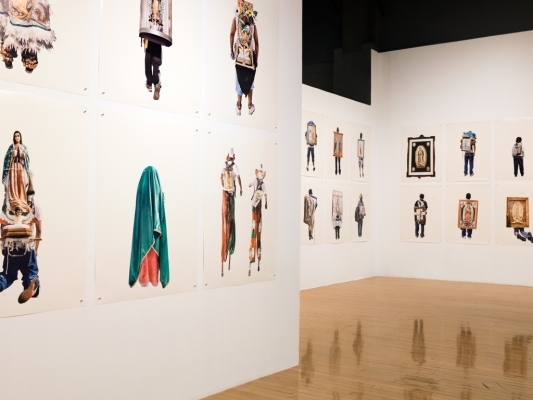 Alinka Echeverría is a Mexican-British female artist, working in the field of expanded photography. She was selected as BMW Photographer-in-Residence at the Nicéphore Niépce Museum in 2015, voted ‘International Photographer of the Year’ of 2012 by the Lucie Awards, and won the HSBC Prize for Photography in 2011. Her website is www.alinkaechevarria.com. Primary Editor: Callie Enlow. Secondary Editor: Sarah Rothbard.